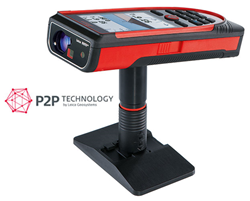 The Disto S910 by Leica Geosystems uses revolutionary P2P Technology to measure distances between two points, angles and inclinations at the same time, from one location. The integrated Smart Base provides both horizontal and vertical angles, enabling even the most complex measurement task to be quickly, accurately, and safely carried out. Anything can be measured from anywhere – no matter what shape, complexity, or how hard to reach. Measurement data can be captured in CAD format as a DXF file like a floor plan or wall layout, or even as 3D data which can later be downloaded via the USB interface. Additional connectivity options include WLAN Wireless or Bluetooth 4.0 smart technology that instantly transfer measurements to PC’s, smartphones and tablet devices. Photos are saved as standard .jpg format. New X-Range power technology gives the Disto S910 a range up to 300m / 984ft while maintaining an accuracy of 1mm. The integrated smart base allows a vertical range of -40 to 80 degrees, while the horizontal range allows a full 360 degree. Up to 50 measurements can be saved in the S910 internal memory and up to 4000 measurements per charge of the integrated Lithium-Ion battery. The integrated smart base with horizontal and vertical ranges allow for brand new functions, such as measuring the distance between 2 points, even if you are hundreds of feet away from the target. Or, just shoot the corners of any polygon to determine the area of walls, floors, or even odd shaped roofs. Shoot any 3 points to measure any angle, including outside angles. The Disto S910 is available now for pre-order at AppraiserLaser.com. Intital orders are expected to ship the week of April 8, 2015. AppraisersLaser.com is a Global Web Supply, LLC Website. Global Web Supply has maintained Leica Disto Gold Club member status since 2012. This means that we adhere to the strict criteria Leica has when it comes to selling and marketing their products. By purchasing your Disto from us, we can assist before and after the sale to insure you have made the correct choice and have the support to back it. You'll get highly-professional support from trained specialists, who answer the questions you ask online and offline before and after you make your purchase.